Dubai: Saudi Aramco, the world’s largest oil company, has received more than $40 billion (Dh146.92 billion) in orders for its bond debut, helping to kick-start a debt sale likely to price in line with or below the equivalent for the Kingdom of Saudi Arabia’s sovereign, a rare development for any state-owned company. The oil giant is offering debt in six portions, according to the people familiar with the matter, who asked not to be identified because the information is private. The company expects to pay about 1.25 percentage points more than US Treasuries for its 10-year notes, compared with Saudi bonds trading at 1.27 percentage points, the banks selling the debt told investors. Traditionally, those risk premiums fall in a high-demand bond sale as the process advances, suggesting Aramco may pay even less. The Aramco deal is one of the most hotly anticipated bond deals of the year, marking the first time the Saudi state-owned company tapped the dollar-denominated capital markets. Aramco sold Islamic finance notes, denominated in local currency, more than a year ago. 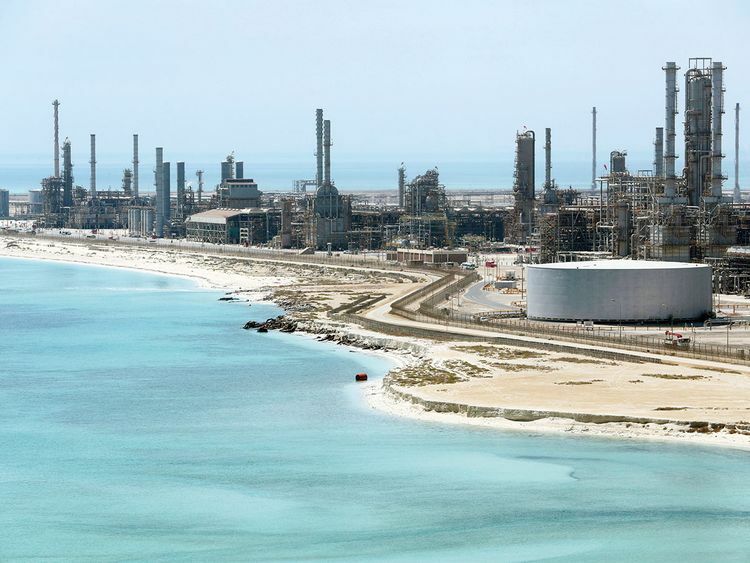 The company plans to use some of the proceeds of the bond sale to pay for the $69 billion acquisition of a majority stake in local petrochemical company Sabic. Jamie Dimon, JPMorgan Chase & Co’s chief executive officer, spoke at a lunch in New York Thursday to market the deal, according to one person familiar with the matter, a rare appearance that underlines the bond sale’s significance for Wall Street. Aramco has yet to disclose how much it would sell, but the kingdom’s energy ministry said earlier this year that the company was looking at about $10 billion. JPMorgan, Morgan Stanley, Citigroup Inc, Goldman Sachs Group Inc, HSBC Holdings Plc, NCB Capital Co are managing the bond sale. The bond sale, being pitched to investors over the last week in a global roadshow from Tokyo to New York and London, has forced Aramco to reveal financial secrets held closely since the company’s nationalisation in the late 1970s, casting a light on the relationship between the kingdom and its most important asset. Both Fitch Ratings and Moody’s Investors Service assigned Aramco the fifth-highest investment-grade rating, the same as Saudi sovereign debt, but lower than oil majors Exxon, Shell and Chevron Corp. The state-owned company generated the most profit of any corporation in the world in 2018 with income of $111.1 billion — more than Apple Inc, Google’s parent Alphabet Inc and Exxon Mobil Corp combined. But accounts published before the firm’s debut in the international bond market also show Aramco — an organisation that produces about 10 per cent of the world’s crude — doesn’t generate as much cash per barrel as other leading oil companies like Royal Dutch Shell Plc because of a heavy tax burden. Aramco is benefiting from a global hunt for yield. Emerging-market bond sales have made a record-breaking start to the year, with issuance among all currencies already climbing above $600 billion, according to Bloomberg league table data. The Saudi government sold $7.5 billion of international bonds in January, while Qatar had a mammoth $12 billion deal in March.